One cooked the crepes while the other applied sauces from a range offered to customers. 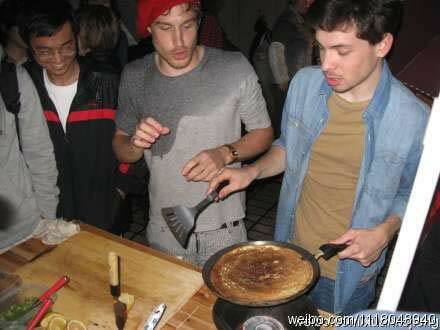 Each crepe sold for 4 yuan (61 US cents). The French cuisine proved popular among locals, with Chinese students taking the opportunity to buy a tasty snack and practice their foreign language skills at the same time. Unfortunately the police shut it down, but it sounds like it was great while it lasted. Way to go, French students! It's probably clear by this point that I've never written a blog before. I am adjusting, but the writing style doesn't come naturally to me. To put it differently, concision is not my strong suit. I need to channel my inner Raymond Carver and focus on economy of verbiage. Practice makes perfect, I hear, so it's fortunate that there will be much practicing in the future for me. In the meantime, thank you for bearing with me through some of these long posts. So here's the lowdown: In October of this year, I'm going to set off for China. Over the course of two-and-a-half to three months, I will be traveling around (ideally 50 - 60 cities) and gorging myself on street food. Why, I hear you asking? Several reasons, really. Mainly, I believe that eating street food is one of the best and most delicious ways to learn about China. Bear with me here. Visiting a foreign country can, perhaps, be compared with looking at a painting. At first glance, you get a pretty good general impression of the painting. You get a sense of the color scheme, the mood, the basic contents...important information, but relatively shallow in the grand scheme of things. The more time you spend with it, though, the more you realize the little details that make the painting special. Things like particularly vigorous brush strokes, or that little person in the background that you didn't notice at first, or the mysterious shape of a smile on a woman's face. To bring this metaphor back to the point, I would say that when you first visit China you get a fine--but shallow--sense of Chinese culture. In order to dig deeper, to look behind the veil of the monolithic Chinese culture at-large, you need to do a bit of poking around smaller subcultures of China. This is where street food can be invaluable. Warm greetings to you, you readers of blogs, you international vagabonds, you sundry masses who have read at least as far as the end of this sentence! Welcome to the official ground-breaking, the ceremonial ribbon-cutting, the festive smashing-of-a-bottle-of-wine-against-the-hull of my brand new blog! Later this year, I will be embarking on an ambitious gastronomic journey through China and its street food, and I am pleased to invite you to follow along on my travels here on this blog. The end result of the trip will be a travel guide focused on the unique street foods available in various Chinese cities. A “field guide to Chinese street food,” if you will. (I’ll say more about the project itself in a future post.) This blog will be the primary repository of my experiences before, during, and after the trip. I anticipate there will be street food reviews, comic anecdotes, trip updates, and the occasional philosophical musing. Basically anything that strikes my fancy. I hope you will find it both interesting and useful enough to consider reading and commenting regularly. Without the active involvement of you, the reader, I’m only talking to myself here, and I’d like to save that sort of thing for my dotage. So thanks for reading today. Without further ado, I officially declare this inaugural post concluded, and the blog open for business! Let the gastronomy begin!